My little brother Andrew arrived into Bangkok early on the 24th. He flew over to spend Christmas and New Years with me. I hadn’t seen him in almost a year and it will probably be a long time again. If you’ve been to Bangkok then you know what a black hole it can be. It reminds me of Las Vegas without the gambling. Although I’m sure you could find any type of gambling you wanted in the city, along with anything else you fancied. It’s a place where anything is possible, the good and the bad, the strange and unexplained, and it can swallow you up. Around every corner are some very friendly people and some very shady people. You need to keep your head up or it’s easy to get played. I had wanted to get us out to one of the islands for some of the trip, but he had reserved us rooms at a nice hotel the entire stay. We could have still gone somewhere else, but the ten days just kinda swept by and we lost ourselves in the city. 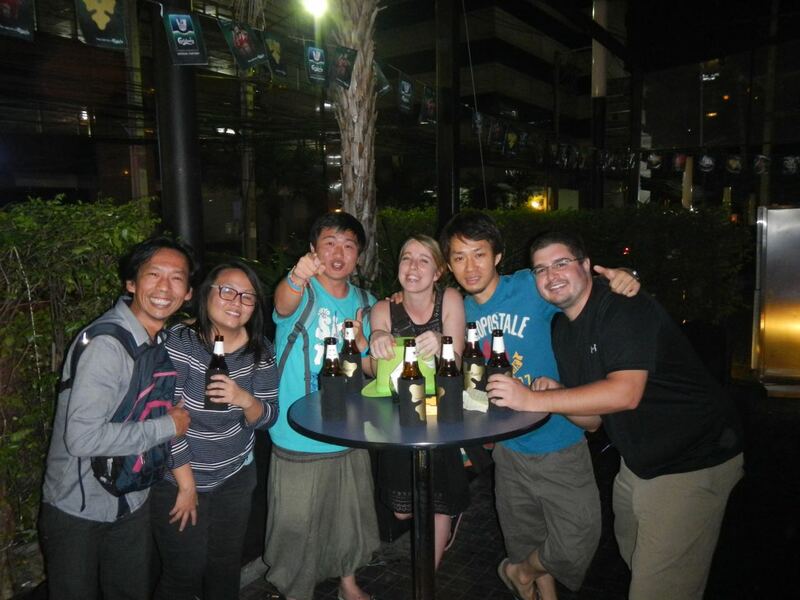 We stayed right in the heart of the debauchery on Sukhumvit Soi 6. The first four nights he had gotten us the presidential suite, and after that we each had our own room. Nice big rooms with views over the city and sleeping in a comfy king size bed will be the fanciest I’m going to live in a long time. A buddy of mine, Steve, was passing through for a few days, and the three of us gave the movie The Hangover II a run for it’s money. Steve woke up with a black eye and some of his hair cut, which might have all been caused by me. I’ll take some of the responsibility for him getting beaten up by four Thai guys. We probably resembled the monkeys at the temples, complete shenanigans. A couple nights were started on the classic Khao San Road, which always leads to trouble. Besides partying and trying to kill our livers, we explored the city and found some fun stuff. One of the nice things about Bangkok is all the delicious food, and we were all over the street food. Some epic feasts were eaten. One night we ordered a table full of Indian food, which was probably the best I’ve ever had. My favorite was a massive feast we had at an open air hole in the wall local joint. We literally filled our entire table with food and drinks. It was covered in curry, papaya salad, stir fries with cashews, rice, pad thai, fried prawns, massive bbq’d whole prawns, beer, and coconuts. The best part about Thai food is it doesn’t make you feel sick when you eat a lot of it. Really heavy foods, like Italian make you end up feeling sick when you stuff yourself. We said goodbye to 2014 with a splash at Fantasia Lagoon waterpark, which is on the roof of a mall called Bang Kapi. You can catch a boat up the small river from Sukhumvit right to the mall, which also has an awesome food court cooking up fresh meals. I don’t get why we don’t have anything like that at home. Our choices are always a bunch of chain restaurants with processed crap. The waterpark was actually a lot of fun, and we looked pretty cool with our swim caps that they make you wear. It’s only six bucks to get in the place. We ran around the like little kids for a couple hours until the sun started to go down and it was time to get going for New Years. Bangkok has a huge New Years celebration at a place called Central World, which is kind of like the Times Square of Thailand. With tens of thousands of people, its a huge mob all crammed in between behemoth buildings, light shows from all directions, a live music stage, and speakers pumping out bass. We roamed around, managed to get almost to the stage, and then struggled to escape the sardine can it became. A guy tried sneaking us into the Heineken VIP area, but even with a bribe offered, weren’t allowed in. I wouldn’t have let us in either. We took it into our own hands and snuck into another area behind a DJ stage where a some Thai guys were making sure nobody came in. They welcomed us right in though, and we hung with them for a while. They had a bag of leaves that they said would make you walk funny, but we chewed on a lot and didn’t feel much. At midnight, from one of the roofs, they put on an incredible firework show right over the top of everyone. I’d never seen so many huge ones going off at once. I ended up dancing around in a fountain during the show with a big dorky green hat on. When it was over we ended up meeting a group of deaf people and one Austrian girl who was with them. They were awesome, and we ended up all going to a bar after everything was over. We spent all night hanging out with them and were the last ones at the bar for an hour. You might wonder how we communicated or what we did for so long, but it really wasn’t that hard. There are many ways communicate besides talking from the mouth. They were an inspirational group of people. To celebrate the new year, we went and played paintball on the first. We had the entire place to ourselves and played round after round for a couple hours. Both of us got shot up pretty well. I caught one in the funny bone that sent electric shock waves through my body. I might have screamed like a girl, maybe. If you’re ever in Bangkok with an open day, it’s a fun spot. They have a nice webpage with directions and can be read in english: http://www.combatzone62.net. The guy is super friendly and has a crew of at least ten of the largest golden retrievers on earth. Somehow we managed to spend ten days in Bangkok, and both took off on January 3rd. Him to Tokyo, and me to the east towards Cambodia. We made some memories that we won’t soon forget, and some that would be better off forgotten. When you’re traveling, it’s always nice to have some family around for the holidays, or it just feels like any other day. I gave a summary of the way these wild ten days went, but most of it is better off not written about. My mom reads this. This entry was posted in Thailand travel, travel friends, Uncategorized and tagged Bangkok, christmas, family, fun, new years, paintball, party, sukhumvit, Thailand, travel, waterpark. Bookmark the permalink. Glad you had a great Holiday. Your stories always make me smile. Thanks Gerl!!!! Sending lots of love. Yes I read these blogs and I love it! Hey why not a picture of Steve? have you spent all of that raccoon money that i paid you for doing all the dirty work that didn’t have the stomach for—wish I could be with you on some of your travels but doubt if I could keep up .will fill Vic in on some of your blogs now that I have found your site,and look forward to a visit someday.